Congratulations April 2018 Employee of the Month. Congratulations to our awesome Personal Support Staff of the month for April 2018!!! We are Super pleased for your great deal of effort and commitment. Kim, is such an awesome professional staff, the compassion and dedication she provides to our individuals served and those around her are incredible. 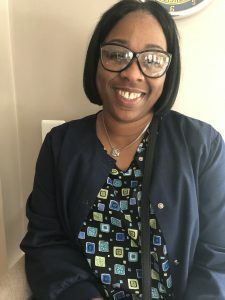 She stays engaged and advocate for our individuals under her supervision in the community and we want you to know that the passion and care you put into your work does not go unnoticed, we truly appreciate you dearly, and all that you’ve done and continue to do for our individuals served and our team. We are so proud and happy to have you as part of the Global Hands Inc Team. This entry was posted in Company News, Employee of the Month, Personal Support Staff in Ellicott City MD and tagged Personal Support Staff in Ellicott City MD. Bookmark the permalink.